There are times, you just take the shot and know it can be fixed in Photoshop. Take the photo below. I was at the Bronx Zoo and I wanted to take a picture of the Panther lounging on the log. Unfortunately, the Panther was behind a glass partition with a strong glare. It’s the perfect situation for the Levels Tool. The Levels Tool works with the image’s histogram to adjust intensity levels of highlights, midtones and shadows. With a few steps, you can fix lighting problems and increase saturation levels to make images pop. 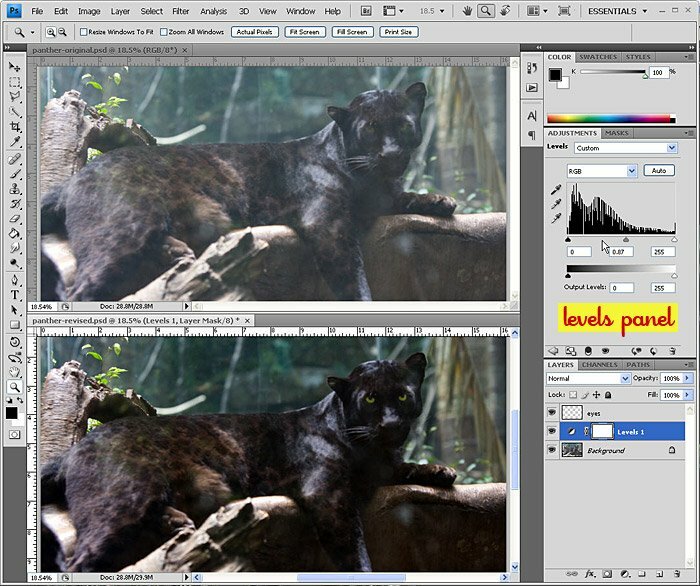 Many Photoshop Pros prefer using Levels to the Brightness/Contrast Tool because it preserve’s the overall image balance. Photoshop CS4 added the new Levels Panel shown above with the non-destructive and editable Levels Layer. The screen captures below reflect the traditional Levels Tool which is applied permanently to the image. Both versions have the same tools, just in a slightly different arrangement. The above screen captures are from the photos of the Panther. The original untouched Levels are the before and the revised Levels are the after. Most people can get away with simply clicking the Auto button, but there is so much more that can be done. Auto Levels will adjust the image data over the full range of the histogram. The 3 sliders can then be adjusted to fine tune the image further. Sliding the Shadows slider will increase the color range that falls into the shadows. The Highlights sliders does the same for highlights. Once these two points are set, the Midtones slider can be adjusted to deepen or lighten the midtone range of colors. The Output Levels can also be adjusted to decrease the Blacks or the Whites of the image. In the revised Panther photo, I thought the Blacks were too dark. I decreased the Blacks in the Output Levels to reveal more of the detail in the Panther. The Levels Tool can correct problem lighting situations. Take a look at the above set of images. The first image shows the original photo with mixed lighting as captured by my camera. In the second image, I clicked on the Auto button which created the typical green cast of artificial lighting. In this case, using the Eyedroppers produced more natural results. Using the White Eyedropper, I clicked on the white of the flag to produce the third image. The results seemed too bright, so I reduced the Output Levels of the Whites a little. I then tried using the Black Eyedropper and clicked on the black iron frame in the window to produce the final image. The results were very natural and accurate to the overall environment. The Levels Tool can be intimidating. But, with a little understanding, the results can dramatically improve virtually any photo.